I’m having another try at a weekly veg box delivery. 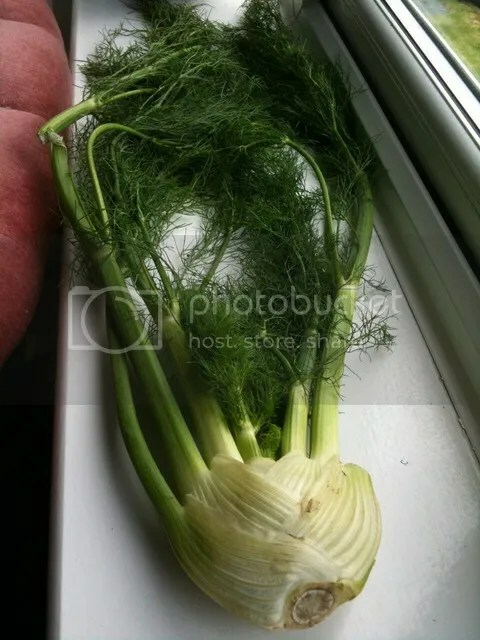 This week’s surprise was a bulb of fennel that was all top! I couldn’t waste that much veg, so I looked around for recipes to use it. A quick trawl of my recipe books turned up trumps with St Delia’s Summer Collection. She includes a recipe for fennel gazpacho, but that involves cooking the ingredients and I didn’t want to cook something only to chill it down (and besides, I was hungry!) The basic recipe I found for gazpacho was on Nigella’s website, but doesn’t include fennel, she also includes tinned tomatoes, but I went for some sundried tomato paste to boost the flavour. 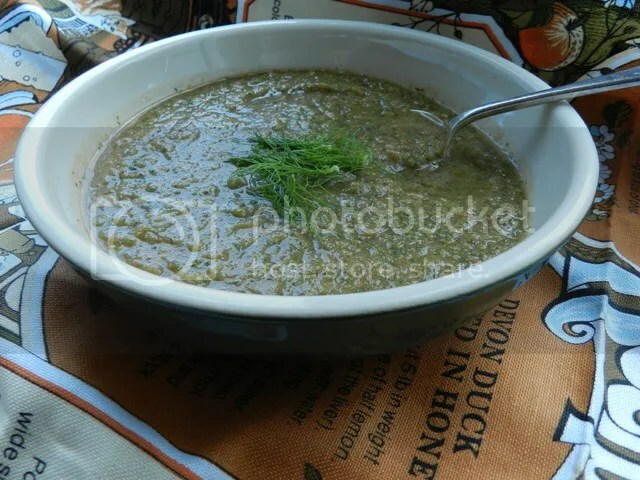 Using the green fennel does make the soup come out with a bit of a sludgy look, but it adds a subtle hint of aniseed to the fresh, garlicky summeriness of gazpacho. And just think of how many of your ‘five a day’ a bowl of this provides! So my recipe for Fennel Top Gazpacho. Put all ingredients into a blender and blend until smooth. I never skin tomatoes (life is too short). I would have peeled the cucumber, but the soup was going to be green enough from the fennel tops, so I didn’t bother this time. Serve with crusty bread, and maybe a bit of goats cheese crumbled over the top. Then my partner in crime Anth suggested giving Slimming World a go – she’d lost five stone with them a while back. “You’ll hate the ra-ra, but the eating plan works,” was her view. And to date she’s been right. Tammi, who runs the group, is lovely and welcoming, and also positive that being a strict vegetarian (almost vegan) wasn’t going to be a problem. I felt comfortable with her immediately. Slimming World claim that you’re more likely to lose weight if you stay to the whole meeting because of the supportive, friendly atmosphere. I gave it two weeks and decided I’d manage on my own, thanks very much. An hour and a half of plodding around the group while each person mumbled about how they’d be back on target next week didn’t seem like a good use of my time. So now I turn up to be weighed, chat to the handful of people who are friendly, then go. As for the eating plan, Anth’s right. It is do-able. I lost a stone quickly, did OK over Christmas and New Year, but have yo-yo’d ever since. That’s down to me and private life crap, though, and not Slimming World. Zoe, a friend of mine who started after Christmas, has done fabulously and isn’t far off losing three stone. But it’s a tricky plan sometimes for vegetarians, as everything is so focused on meat and eggs. I’ve never seen an eating pattern that advocates so many eggs. Even if I liked the damned things, I could never eat that many. And even the ‘green’ recipe book has dishes with meat in. Yes, I could probably adapt them, but I kind of resent having to. And I still can’t get the hang of the ‘syns’ – the extra treats they let you have. They often don’t bear much resemblance to how low in fat or calories something is (and nuts and seeds come in horribly high). And trying to find out the syn value of stuff can be a hassle if the item isn’t in the little book they sell you – I’m buggered if I’m phoning Slimming World’s premium rate phone line to ask. Yes, I know it’s a business. But sod that for a game of soldiers. So I’m building my eating plan around baked potatoes, pasta and rice – all ‘free’ food. And the reason they claim you’ll never be hungry on a Slimming World regime is because these certainly fill you up. I’ve got in the habit of buying the tubs of M&S tropical fruit as well. Yes, it’s probably an indulgence. But at two for £5, there isn’t any waste. I’m going to stick with it, because I think it does work, and I get the feeling I’m more likely to keep the weight off on this plan – they call it a lifestyle change rather than a diet. And if it comes off slowly, so be it – I’ll settle for that. 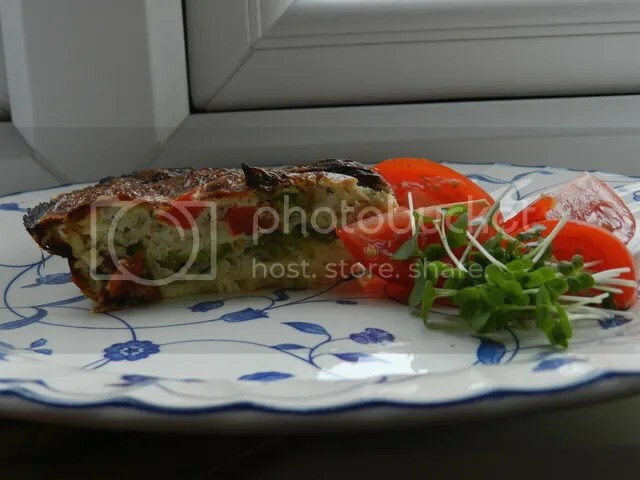 If you go to a Slimming World group, it should only take about three weeks before someone tells you two recipes: Slimming World Chips and Slimming World Quiche. Due to the way Slimming World organises its diet plan, you can eat as much as you like of these foods and stay on the plan. I may come back to the chips later, but for now I want to concentrate on the ‘quiche’. I put the words in inverted commas because when I described it to a friend he said, “That’s not quiche!” He’s right. It has no pastry crust, it has no milk or cream. It’s much more like a baked frittata or spanish omelette. It also makes a quick and tasty midweek supper or weekend lunch. Note: – the veg in the recipe is what I used to make it this time. It varies according to what’s in the fridge. While red pepper is a perennial, mushrooms, cold new potatoes, cooked carrots, courgettes, aubergines, olives, capers, even peas would be fine. Be careful with the courgettes and aubergines, though as they leak a lot of water – it might be worth pre-cooking them. Essentially, if you’d like them in a spanish omelette they’ll do fine in this. You can also add grated cheese to the top before baking, but I’ve stayed true to the low-fat nature of the original and missed it out for this one. Beat the eggs and stir in the cottage cheese (draining any excess liquid from the carton if there is any on the top). Add the salt, pepper and herbs and stir those in too. Now add the veg, making sure they’re evenly distributed. Add to a pre-warmed oven, 180C, for 40-45 minutes, or the eggs have set. Take out and leave to stand for about 10 minutes before slicing and serving. It’s great hot, but I think it’s even better cold. I hadn’t been a vegetarian for long before I started coming across references to seitan, mostly from American food blogs. I gathered it was something close to tofu in function, if not origin. I put it on the list of things to try when I found it and forgot about it. Only I never did find it. Unless it’s marketed in the UK under a completely different name, I just haven’t seen it in any healthfood shop – including the excellent one near me. I kept seeing references to it in recipes but had no way of getting my hands on a supply. Luckily, you can’t search for seitan for long on the internet without coming across a recipe for making it. It looked reasonably easy, so I decided to give it a go. I didn’t want to make a huge amount to start off with so I took 500g of plain white flour and mixed in enough water to make a workable dough. I wasn’t expecting this dough to rise, so I didn’t make it as wet as I would make a bread dough, but it was softer than a pastry dough. I needed it for 20 minutes, until I had a smooth ball. I rested that for half an hour. Then came the fun part. Seitan is the gluten of wheat dough without the starch. So I put the bowl in the sink, turned on the tap and started to rinse the starch out of the dough, working it in my hands all the time. Remember when you were a kid and were chewing gum when you decided to eat a sweet at the same time? Remember how the gum went all soft and gooey? That’s what the seitan felt like in my hands. I kept going and hoped that this was what it was supposed to be like. Once the water had run clear, I was left with a lump of gooey dough about a third the size of the original. The next stage was to cut it into lumps and simmer it in stock for 20 minutes. I simmered it in water and soy sauce. It does swell during cooking. When it was cooked and drained, I was left with uneven chunks of something resembling cheap chicken breast. I tried a bit to eat and it was essentially flavourless, chewier than tofu, but not as dense as real meat. Still, it wasn’t unpleasant in itself, so I decided to try it in a recipe. I did a Seitan and whatever veg were in the fridge stir-fry with black bean and hoisin sauce. It wasn’t bad. It’s not like eating meat, but it does give you a satisfying mouth-feel that’s all its own. There are far worse meat substitutes out there (Quorn Bacon I’m looking at you) and I’d happily eat it again. It is a bit of a faff to make though, so unless I find somewhere to buy it, it’ll come behind quorn and tofu in my preferences.